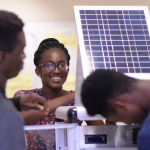 Ashesi University prepares graduates to create progress in Africa. Ashesi University Foundation helps make this urgent work possible by mobilizing support for the university. A quick introduction to Ashesi University Foundation. Learn about our work, recent milestones, and what your donation can support. Take a look at Ashesi’s major milestones in 2018, including reaching 1,000 students, receiving a presidential charter, and opening 5 new campus buildings. To extend the Ashesi Education to 1,200 students by 2020, we are working to grow our campus, invest in faculty development, increase scholarships, and support the Education Collaborative at Ashesi. Learn about the strategic priorities for both the university and the foundation. In this Report, we highlight our 2017 accomplishments, look back on our 15 years of educating Africa’s next generation of leaders, and share our priorities for the future.